According to the Intergovernmental Panel on Climate Change (IPCC), the leading scientific institution on climate change research, atmospheric concentration of carbon dioxide, the greenhouse gas most attributed to causing climate change, has increased by 31 percent since the 1750s. This increase is caused by human activities, primarily the burning of fossil fuels. As a result of increasing carbon dioxide and other greenhouse gas emissions, changes in the earth's climate have been observed. The IPCC has stated that the 1990s was the warmest decade on record, with 1998 being the warmest year since 1861, before which adequate data is lacking. It has been recorded that the global average temperature has increased by 0.6 degrees Celsius in the past century and has been accompanied by observed sea level rise. Severe weather events, like El Nino, have also become more frequent in the past decades as a result of the changing climate. Based on these past and current trends, scientists have forecasted likely future climate conditions. It has been predicted that, among other things, regional weather patterns will likely be altered,changes in global precipitation patterns will occur, an increase of severe weather events is probable, and a general shift of climate conditions to higher latitudes will result. These climatic changes, already being witnessed today, will have a significant impact on human existence. Even slight alterations in climate conditions have the potential to greatly alter society. 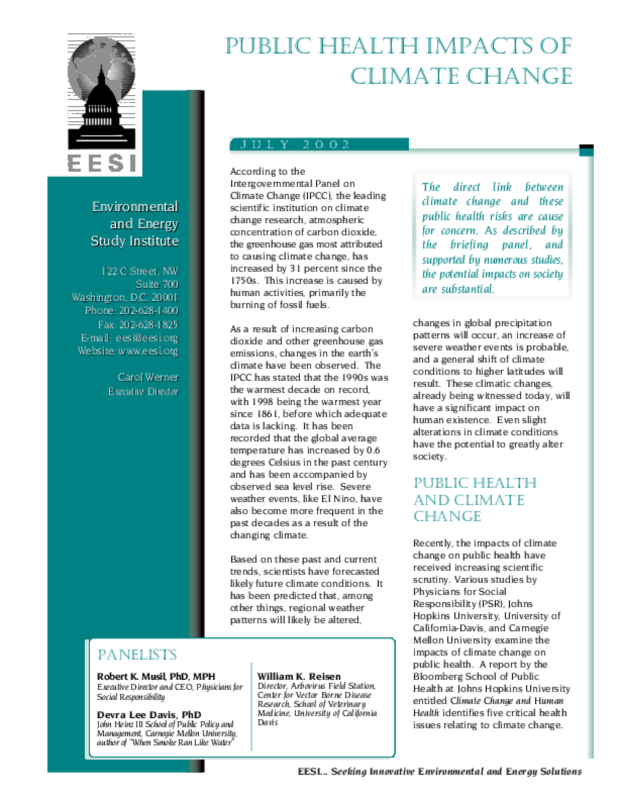 Copyright 2002 Environmental and Energy Study Institute. All rights reserved.